Some would argue that for all the abundance of intellectual capacity in Addis Ababa University (AAU), the number of academic staff members who have immense experience in the practicality of their studies is quite limited. It is one thing to have an immense theoretical understanding of a discipline and quite another to have a practical exposition to it. Whether in the sciences or the social sciences, the number of academic staff members who constantly roll their sleeves up and get their hands dirty with some practical rendition of their education is not that great. In the industrial settings across our country, on the other hand, procurement of professionals who have received proper training is just picking up. Ranging from engineering to journalism, the wide application of non-professionals is still the norm. In our firms and enterprises, traditional ways of doing things that could use a fresh scientific approach to enhance efficiency and effectiveness are still treated as sacred. This condition, however, seems to be changing with the university reaching out to industries to forge a collaborative business relation which is complemented by the solicitation of service by some industries. The trend breaking moves by the parties have materialized since the university recognized the increasingly dire need for linkage with industries towards building knowledge based industrial economy and reorganized its structure and reviewed its programs to match the needs of the industry sector three years ago. Accordingly, AAU set up the University-Industry Linkage and Technology Transfer Office in 2013. Since its establishment, the office has drawn a lot of attention from within and outside of the university. This article provides a glimpse of the encouraging engagement between the university and the industry within the last three years. As identified by the University-Industry Linkage and Technology Transfer Office in its 2013 business incubation center establishment document, the most common and effective technology transfer channels in addition to the human embedded knowledge transfer channel are: university-industry cooperative research, industry-sponsored (contract) research, consultancy, patent licensing, student industrial internship and technology business incubation. To carve out a sensible sketch of the major activities carried out in the past three years, let’s take a closer look at the engagements that fall within each of the knowledge transfer channels. Since university-industry cooperative research and industry-sponsored research are related channels, we have merged them into one. 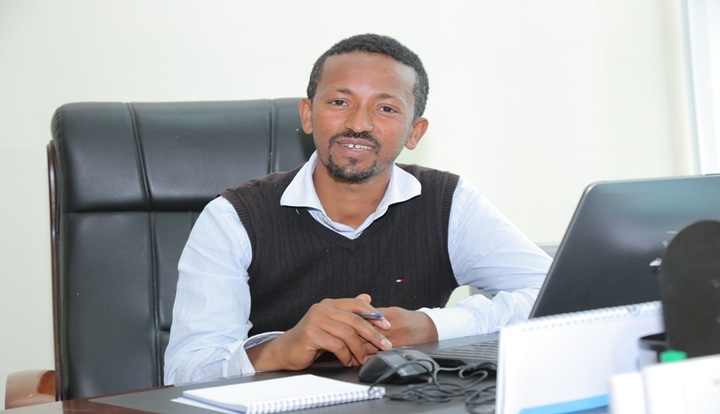 Director of the University-Industry Linkage and Technology Transfer Office, Wondwossen Bogale (Ph.D.), raised the engagement with Berhanena Selam Printing Enterprise as one of the most notable undertakings under this section. Despite being the pioneer enterprise in printing in the country, explained Wondwossen Bogale (Ph.D.), potential big clients such as tobacco monopol and Ethiopian Airlines resort to getting their printing work done outside of the country. According to the director, that is indicative of the unanswered need for more quality by Berhanena Selam. The young director further explained that their engagement has two phases, with the first part already completed and the second underway. The first phase has to do with need assessment that aimed to point out the shortcomings of the existing work. After conducting a year and half research on the matter, explained Wondwossen (Ph.D.), the first phase ended up recommending the launching of two printing related programs that can be run by the AAU or by an independent institution to be established by the printing enterprise to tackle the issue of human capacity building. The second phase already underway deals with curriculum development, organizational structure and legal/legislative structure. The other notable engagement the director raised was with the Ministry of urban and housing development. The Ministry wanted to build the capacity of its employees and contacted us to come up with programs that would help their cause. Accordingly, twelve programs have been designed in different departments of the AAU that would complement the skill set required by the Ministry. For instance, there are undergraduate and post graduate programs to be launched in the civil engineering and law departments that are pertinent to the needs of the Ministry. He noted that this project is about to be implemented. Another noteworthy collaboration with Small and Micro Enterprise Agency is nearly complete. In this project, the university studied the sort of support and backing needed to upgrade these small and micro enterprises to medium scale. With these SMEs engaged in various activities, the support needed differs with the sector of engagement. Accordingly, the study identified the type of assistance needed to scale these enterprises up. Yet another engagement is with Tekle Birhan Ambaye Construction. Wondwossen Bogale (Ph.D.) stated that the private construction company has identified and submitted the areas of its work that it needs to be studied for further efficiency and effectiveness. With the projects already identified, explained the director, the university is working on selecting the qualified people to handle them. On the side of the construction company, it has already provided five internships for AAU students. Consultancy is one of the activities in which the university has been involved even before the establishment of the University-Industry Linkage and Technology Transfer Office. The director described it as the strongest of all the channels pursued by the university. He cited the Adama wind farm and the Grand Ethiopian Renaissance Dam (GERD) as just two of the major national projects the university has consulted. He, however, noted that there is even further to go for the consultancy work by the university as such engagements do not come often enough. He said: “just a couple of new consultation contracts a year are not good enough. We need to take the figure up to at least one every month.” In his opinion, more consultation jobs can be used to build the capacity of experts even further through engagement in addition to raising their incomes. Director of the University-Industry Linkage and Technology Transfer Office, Wondwossen Bogale (Ph.D.), remarked that there are numerous findings in the university that need to be patented. He raised the finding called “Zeo-light” by Yonas Chebudie (Ph.D.) and his Spanish compatriots as an instance. He said that the AAU applied for patent of the finding on their behalf in Spain and is helping transform it into a company. He went on to explain that researches done under the university bear the university’s name up on release; however, the researcher has their own rights. The university applies for the patent on behalf of researchers and the two parties share the financial proceeds that follow in half. The main hurdle in the application of patent licensing has been the absence of an Intellectual Property Right (IPR) Policy. The IPR policy protects the interests of the university and the researcher informing members of the AAU community of their rights and obligations relating to IP created in the course of conducting university activities. It also aims to draw up an appropriate, fair and mutually beneficial incentive-structure to reward the university and members of its community from the commercialization of IP. Under the policy, the relevant department and laboratory used would benefit from the commercialization of the IP. Wondwossen Bogale (Ph.D.) pointed out that the university has recently formulated an IPR policy and disseminated it to its community. He remarked that his office has notified staff, through their departments, of the need to bring forth their Intellectual Properties (IPs) to be patented under the university. He then expressed his office’s readiness to do its best in commercializing the patented IP for the benefit of both the university and the staff member. Student internship has been around for long in the university. Therefore, there has been enough experience to identify the problems associated with it. Accordingly, the University is trying to design a way to make it more effective. The major undertaking, in this regard, is the internship policy it is trying to formulate. Wondwossen (Ph.D.) stated that the internship policy would clearly state the sort of things students would be expected to deliver to industries during their internship sessions while setting out the university’s expectations from their spells. Another issue that the director raised about internship was the need to make student’s venture into industries worthwhile by encouraging them to come up with issues they could research in their senior theses. He pointed out that internship sessions complemented by dedicated advisors could help students identify research topics that have practical bearings on various industries, rendering the students important and their researches marketable. Such a scenario would definitely benefit all parties involved with the internship program serving its purpose better than ever before. It would also be easier to find industries that would provide internship to our students with an internship program that has a good reputation. The technology business incubation center sets out to nurture findings and ideas into full-fledged business companies selling the end products of the findings. To nurture the development of the ideas, the university plans to treat them in an incubation center being built within the premises of the school of pharmacy. With the center expected to go operational within a month, five ideas that have been chosen will be incubated for the coming three years. During that time, the people behind the chosen ideas will be provided with funds acquired from SIDA. They would also be provided with trainings and office space. These packages of support are expected to help change the ideas into products while nourishing their marketing strategies to ensure the penetration of the product in the future. The financial and material support provided for three years is projected to turn these chosen ideas into full-fledged companies operating in the market. The incubation center would take in new ideas annually. At the end of their three year’s spell in the incubation center, therefore, the support would be terminated. The university would claim a small share in the newly established companies that it nurtures. The process would help the country create companies that introduce new technology to both the national and international market. Although the maintenance and installation of the old building in the school of pharmacy, earmarked as the incubation center, with electricity, water and internet lines has taken a long time, all that seems to have finally come to an end. Wondwossen (Ph.D.) called on the people behind the projects to feel motivated enough to embark on the real challenge of turning the ideas into products, despite the one year delay in getting the building ready for the chosen projects and the immense frustration that has left them with. One of the main challenges is that the university overhead and tax amount to 55% of the payment for the service provided to industries. That leaves the university’s experts with 45%, which is generally perceived to be a small portion for the actual work done. This situation has created a tendency, on the part of experts, of transferring a section of the tax to the industry by proposing for more money to offset its effect on their incomes. The result leaves industries paying more than they should, discouraging them from soliciting such services from the university. The current tax rates, on the other hand, dishearten university experts from participating in such projects as they do not compensate their efforts fairly. The director, Wondwossen Bogale (Ph.D.), remarked that tax exemption or a significant decrease of the tax rate would go a great length to encourage both sides into linkage. Another major challenge is the lack of will to spend on the part of industries. Wondwossen (Ph.D.) noted that this mainly emanates from a lack of trust on the role of universities as effective solvers of their problems. The dependence on imported technology and foreign experts lingers on as the use of local universities towards such causes is still at its infancy. Yet another challenge raised by the director is the lack of recognition, on the part of university experts, of the need to seldom serve for free. He pointed out that there is a sacrifice that has to be made now to build the culture of industries inquiring about the services of universities to solve their problems. He further explained that there is a futuristic sense of financial feasibility to pro bono work as the work relations tend to bring more business along that line. In conclusion, he called for a positive attitude and cooperation from the members of the university community as the efforts towards better UIL spell benefits to all parties involved in addition to the national perks it promotes. Considering the improvements in technology and production capacity that UIL makes possible, nurturing the current baby steps of linkage is highly commendable.